Click here if audio player doesn’t work. Today is the stupidest day of the year (and you’re not far behind, tomorrow, so stop looking so smug). The Wednesday after the All-Star Game is the one day on the calendar without any major sports which makes it extremely stupid. I’m more concerned with the utter lack of baseball games (save your AAA All-Star Game, people) and this year is even worse as the break has been extended through Thursday. I am torn on this change. Usually there are 6-7 games on Thursday which is entirely unfair to the teams who have to play while others get another day of rest. Selfishly I was always glad to see baseball return, but how was that not an all or nothing day? They landed on the side of nothing so we’re stuck with two baseball-free days. This is like giving Jesse Pinkman a wheelbarrow full of meth for nearly three months and then none for two days. This isn’t going down from wheelbarrow to radio flyer red wagon to a bucket full to a handful, just wheelbarrow to zero. So to help get you through this mess, I have 26 games from the first half that contain some of the best, most exciting baseball we have seen thus far. Obviously the viewing of these games will require an MLB.tv subscription which you should already have secured back in February (yes, February), but just in case you haven’t it is on sale for $80 bucks. That’s a steal in my opinion and no, I’m not being paid by MLB to say that. It’s seriously the best purchase I make yearly, except for the food that keeps my beagle alive. Sure, this first one is a bit homerish (pun intended), but two of the biggest stars in the game were paired together this offseason when Fielder signed in Detroit and everyone was excited to see them as a 3-4 combo in the Tigers lineup. They didn’t wait long to display fireworks (2nd game of the year) and they did so against one of the better pitchers in baseball in Josh Beckett. Lost in the mix is the Tigers bullpen cobbling together 5.3 scoreless innings. It’s easier with a huge lead, but it was only 2-0 when Doug Fister left with an injury. No, this isn’t going to be 27 Tigers games. It is merely coincidental that the first two involve my favorite team. But I stand by the selections. Who doesn’t like watching Boston get smashed 10-0 and who doesn’t like watching Boston’s hearts get ripped out in extra innings? Textbook win-win. Lost in the shuffle of allowing 13 runs is that Vicente Padilla (4 IP, 4 K) and Franklin Morales (2 IP, 3 K) threw six shutout innings. Thankfully Mark Melancon is a thing. The feature of this game doesn’t start until the eighth inning, but it is a nice 3-3 battle between the Reds and Cardinals before that including a 4-hit day from Joey Votto. The only thing lacking is the trademark 100+ MPH heat of Chapman, but he does sit 96 with his fastball and threw strikes in 63% of his pitches. If you don’t love a 1-0 duel between aces then you probably don’t love baseball. Neither ace figures into the decision as this one goes 11, but what a great game between a pair of the game’s finest on the mound. Perhaps some foreshadowing was seen in this game as Melky Cabrera turns in a 3-hit day in a game that saw just 13 hits in all. A few weeks later he notched 476 hits in May alone and capped off his first half with an excellent All-Star Game that included the best shoes of the night. The key component of the Johan Santana trade finally pays dividends… for a different team. The degree of difficulty certainly wasn’t highest as he cut through the Mariners lineup, but Humber isn’t exactly Halladay either so no need to discount his achievement. Furthermore, if perfect games were easy against crappy lineups, we would see 7-10 a year. While no-hitters and perfectos have been a bit more frequent in this new pitching age, they are still far from common. I love the symmetry of Humber’s perfect line that included nine punchouts, too: 9-0-0-0-0-9. He’s been far from perfect since (7.47 ERA), but on this day he shone brightly. Darvish had an inauspicious start to his MLB career with an ugly debut against the Mariners followed by better, but still far from special starts against the Twins and Tigers. He walked four or more in each of those three starts so a visit from the Yankees looked like it could be troublesome. Of course, whenever you really think something will happen in baseball, the opposite often comes through instead. Darvish was masterful as he scattered seven hits and two walks in 8.3 scoreless innings. Not only is it Harper’s debut, but Stephen Strasburg is on the mound for the first place Nationals who are facing the first place Dodgers with Vin Scully calling the game. It really doesn’t get more basebally than that. Chad Billingsley was hitting on all cylinders, too, and this was actually one of his best outings of the year. If all those individual components aren’t enough (stop being greedy, jerk), there is the fact that it was a thrilling extra-inning game that was capped off with a Matt Kemp walkoff home run. Remember what I said about things sometimes not living up to the hype? Pitting stud arms like Halladay and Hanson together in a battle of division rivals has all the makings of a 2-1 gem. This game was actually scoreless through two innings which makes the 15-13 score even more impressive. It was Carlos Chooch Ruiz’s coming out party as he went 3-for-5 with two doubles, a homer and seven RBIs. Every starting position player had at least a hit, six had 3 hits and five others had a pair of hits. Oh, and it ends on a walkoff home run by Brian McCann Chipper Jones. May 2nd was an incredible day of baseball. Like whoa, Scoob, the Twins couldn’t earn a single Scooby Snack against Weaver on this night. The rarity of this game wasn’t so much the no-hitter as it was the Angels winning without the aid of Mike Trout. Trout had been up for a few days at that point and was inexplicably given a day off. Fortunately the offense got loose on Liam Hendriks en route to a 9-0 smash job. Neither starter made it through five, but then runs were in short order for quite some time. There were eight scoreless innings from the 9th thru 16th innings and except for a run for each team in the eighth, there would have been 11 scoreless. Adrian Gonzalez and Chris Davis both went 0-for-8, but Davis was given the opportunity to make up for his failures and did so with two scoreless innings and ended up with the win. In fact, Davis exacerbated Gonzalez’s horrible day by striking him out in the 17th. If you have a free six hours and seven minutes, enjoy this epic. This was the eighth game of an incredible 16-game hitting streak by Hamilton during which he hit .424/.493/.966 with 10 home runs, 26 RBIs, 15 runs scored and 64 bat tosses. This looked like the jump off toward an all-time season, but he cooled off bit in June. Alas, he is still pacing toward shattering the tossed bat record and putting it out of reach forever as most players know how to hang onto their bats or understand the value of using aids to do so like pine tar since chucking your bat into the stands three or four times a night isn’t ideal from a safety standpoint. See, I went nine games without a Detroit game. There is a no-hitter watch every fifth day when Verlander toes the slab and he showed why again on this Friday evening in Detroit. He walked the second batter of the game taking perfection out of the equation and the Pirates would go another five innings without a base runner (Andrew McCutchen walked in the 7th) and seemed poised to go hitless until Josh Harrison’s dumb face stepped up to the plate in the ninth. He stuck his bat out (probably a stupid bat, if I had to guess) and made some fluky, lame-o contact with the ball for a cheapie single up the middle. I’m not mad, I swear. SHUT UP! After going nine games in between Tigers mentions you know I had to go back-to-back with ‘em. Scherzer set the bar for strikeouts on the season (which would be matched, but not topped thus far) with a dazzling performance against the Pirates. Even seven innings of two-run ball only took his ERA down to 5.73 after an awful April, but including this game he has a 3.56 ERA in his last nine starts with 73 Ks in 55.7 innings (11.8 K/9). Yeah, the Angels lost (3-2) and I actually can’t remember if Trout makes any special defensive plays (two of the five tools are throwing ability and defense) , but if you want a single dose of what he brings to the table, at least offensively speaking, then this game is for you. In this 13-inning affair, Trout goes 3-for-4 with two singles, a home run, an RBI, two runs scored, two walks (one intentional because teams are scurrred) and two stolen bases. He also plays centerfield, leftfield and then centerfield again. Versatility is his middle name (don’t check that). Yeah, I realize I’m trying too hard with that headline but just… shut up, please (I said please!). On the opposite end of the spectrum from that Coors Field Home Run Derby is this Memorial Day throwdown between Chris Sale and Matt Moore, who both sliced up the opposition in a breezy 2-1 game that took just over two and a half hours. Sale drew the attention for his 15 Ks in 7.3 innings en route to a win, but Moore was impressive with 10 Ks in 7 innings in what was easily his best start to date topped only by his 7 shutout innings against Miami a few weeks later. Santana gave everyone the easiest headline of the year by having a first name that starts with something that rhymes with “no” and then throwing a no-hitter. As his pitch count mounted (thanks in large part to 5 BB), everyone wondered if Terry Collins was going to leave him in for the chance at history, but I’m pretty sure he’d have had to fistfight him to bring him out of that game. It was a special game and while there was a blown call on what would’ve been a Carlos Beltran hit, I don’t think it takes away from greatness of this one. Definitely watch the Mets broadcast on this one. Not just because the special event is happening to them, but because they have the best team this side of Scully. I love games that have multiple ties/lead changes during the extra innings portion and this game features just that with scoring in the 10th and 12th innings. Five of the 13 runs scored occur after regulation. There are several would-be heroes throughout the game before, yep you guessed it, Bryce Harper comes through with the walkoff win. It helps that he ends up the hero, but any game with seven Harper at-bats can’t be bad. It wasn’t best start of the year, but it was impressive to watch Strasburg slice his way through the Sox lineup for six strong innings. He caps the outing by striking out the side twice en route to his 7th win of the season. Additionally, Harper shines again with a 3-for-5 effort that includes a double and home run with three RBIs and two runs scored. All that with Fenway Park as the backdrop. The peak of Millwood’s season is undoubtedly his filthy four start run that saw him go into the Bronx, Coors Field and Arlington as well as host the Texas Rangers yet come out on the other side with a 0.67 ERA. He was brilliant for 27 innings with a 0.74 WHIP and 20 Ks. After a stumble against the White Sox, he was back at it on this night against the Dodgers throwing six no-hit innings with six punchouts and a walk before succumbing to injury and turning the game over. Charlie Furbush, Stephen Pryor, Lucas Luetge, Brandon League and Tom Wilhelmsen combined for three no-hit innings of their own (Pryor’s two walks being the only blemishes on their collective record) to complete the team no-no. Adding to the drama is the fact that it was a scoreless game through six and a half innings before Kyle Seager’s RBI single plated Ichiro for the game’s only run. This game is the Pirates season in a nutshell: a big effort from A.J. Burnett and McCutchen leads the offense. They haven’t been the only the two to lead the team, but it’s an apt microcosm. Cutch went 2-for-3 with a double and homer, a walk, all three RBIs and a run scored in the 3-2 win. This was their first day in first place for the season and only a tie at that, but they entered the break with spot all to themselves. They fell back to second the day after this game and stayed there until early July when again a McCutchen performance led them during a Burnett start. I didn’t include that game because Burnett was actually knocked around a bit. The Giants scored in the first five innings of this one so the result was never really in question, but it didn’t take away from Cain’s special night. There were incredible defensive plays to save the perfection, too, including the last play of the game. Of course Melky Cabrera has a multi-hit game, too, pushing season batting average to 2.498 (yes, he gets nearly 2 ½ hits per AB). Before Cain’s perfection Dickey limited the Rays to a single hit, and a dubious one at that, fanning 12 and extending his scoreless* streak to 33.3 innings. Then five days later, he went four no-hit innings before yielding a single to Wilson Betemit. He upped the ante strikeout-wise, this time punching out 13 and extended the innings streak to 42.3. It would last two innings into his next start as the CC Sabathia-Dickey showdown on Sunday Night Baseball failed to live up to its billing. Back-to-back one-hitters are impressive for any pitcher, but there is an added amount of excellence to Dickey’s as a knuckleballer. Sale wound up on the wrong end of this duel, but it was an excellent game as a current ace and potential future ace matched each other pitch for pitch in a 1-0 game that went 10 innings. There were more innings (10) than hits (9). Sale leaned on the strikeout with seven in eight innings while Greinke was less-reliant on them netting just four in nine, but still felt plenty dominant inducing tons of weak contact. Cook is one of the premier groundball artists in the game and this actually wasn’t even his best shutout in terms of fewest pitches. He has a 79-pitch shutout under his belt from his time back in Colorado and a 74-pitch complete game (during which he allowed two runs). If you want to watch a team just get decimated in a brisk 2 hours and 18 minutes, this is your game. What? Really? I am sure bettors lost tons on the over with this one, even if it was an over/under of 15. Wells hadn’t pitched in the majors in two years and had been awful when he did from 2004 through 2009 yet he throws up seven scoreless in Coors Field. Pomermanz is a promising rookie, but Coors has been chewing up established veterans let alone promising rookies this year so this had trouble written all over it. So of course he throws six strong allowing just an unearned run on two hits and three walks. It is easily the best trolling by a stadium since Veterans Stadium was seriously used for actual sporting events for 30+ years. I can’t imagine Carlos Quentin costing the Tigers a lot to acquire him from the Padres which only makes the prospects of a deal more appealing. He loves Comerica Park, too, with a .292/.370/.611 line including 10 HR, and 26 RBI in 127 plate appearances. I’ve been the Delmon Young fan for a few years now, but I want my favorite team to get better and Quentin is significantly better than Young or Brennan Boesch and he understands the value of a walk. 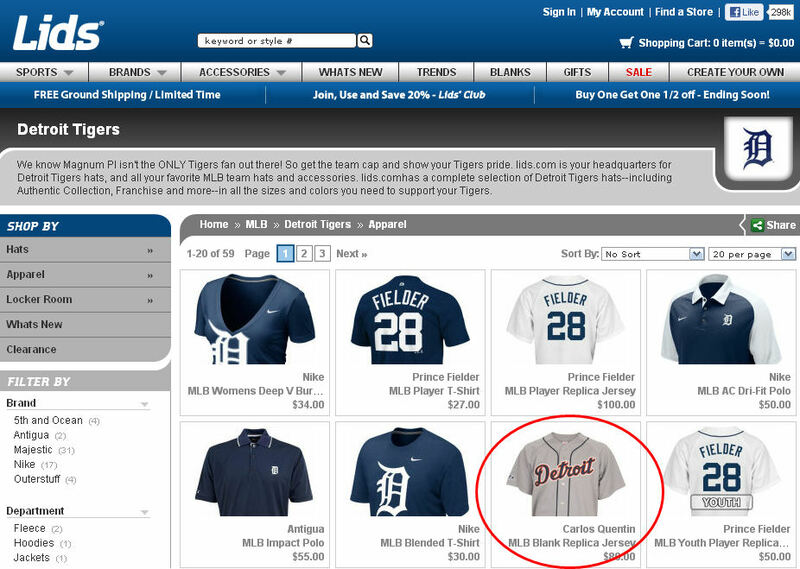 Here’s hoping the Lids.com webmaster has an inside track on MLB trades. Dodgers fans, keep refreshing in hopes of seeing a Cole Hamels jersey. Quick note about the Best Pitches of the Month feature. I really enjoyed doing it for April, but it is a big undertaking for a crappy computer which mine has unfortunately become in its seventh year of existence. It is a labor intensive project that wouldn’t be so problematic on a better unit, so I’m going to suspend the feature until I can afford a new laptop. Between having MLB.tv and the GIF-making program up (as well as any others not related to the project), the computer would freeze and skip and I often had to remake GIFs that were jumpy or skippy during recording. I’ll still make GIFs in one-off situations where I think they are really necessary, but since the Best Pitches project was more of a luxury, I’m just going to hold off for now. Once I get a job, I’ll get a new computer and it will return (and I’m sure I’ll do a ton of random GIF’ing… watch out for beagle GIFs!). I’ve teased a big piece on Trout & Harper both on last week’s podcast & via Twitter. I’m finally about done and it will be out on Tuesday. Just a heads up for everyone including those who emailed asking about it. No, I’m not joining the oil business with British Petroleum. Rather, I have signed on as a contributor over at Baseball Prospectus as part of the fantasy baseball team. I will be doing two columns a week covering starting pitchers (yes, we call that right in the wheelhouse). I’m ridiculously excited by this opportunity. Nothing changes here as the site will remain functional. Speaking of that, content will be ramping up now that we are starting to get some real data to play with and examine. Samples are still small, but pitchers are amassing three and four starts so it is worth taking a look at things now as opposed to overreacting to everyone’s debut start. Look for another piece on Monday. Despite the extended vacation, I am very much alive & well. Look for new pieces all weekend. I apologize to those of you who thought I just vanished, I should’ve updated the vacation post, but it was a bit unexpected in terms of how long it lasted. New content this weekend: guaranteed! This post would’ve been more appropriate a few days ago, but I am on vacation this week which is why I haven’t been posting much. Look for more next week. Sunday Twidbits will finally return, too.